& get a tax deduction. Instant Car Donation was founded with the goal of creating a win-win for charities and donors. We connect people like you, who want to donate your car to support the things that matter most, with local charities, using an a simple and straightforward process. Have you been searching the internet, trying to make sense of the rules for donating your car? Look no further. Our service provides you with the opportunity to focus on deciding which respected charity is right for you, rather than spending time navigating the complicated tax laws for car donations. All it takes is a few moments on your part to fill out your contribution form. We will arrange a free pickup of your vehicle, and assist you in recieving the best tax benefit possible for your generous gift. We take pride in helping smaller and medium-sized charities receive car donations, and providing support to those who are doing some of our community's most important work. Founded in 1914, Fruitlands Museum strives to inspire and educate through the heritage, nature and art of New England. Fruitlands Museum is committed to sharing the unique perspectives of artists, both historical and contemporary. The frequently changing exhibitions offer a wide variety of selections from Fruitlands' collections, other museum and private collections, and contemporary artists from the New England region. Performing Baroque and Classical music at the highest level of artistic excellence. A principal leader of Boston's arts community since 1815, the Handel and Haydn Society is dedicated to performing Baroque and Classical music at the highest level of artistic excellence and to sharing that music with as large and diverse an audience as possible through concert performances at Symphony and Jordan Halls, tours, recordings, radio broadcasts, and outreach initiatives for students and underserved communities. Founded in 1954 and guided by our Jewish values, the Jewish Federation of the Berkshires brings together the Berkshire Jewish community to leverage its resources to care for Jews in need here and abroad, assure the continuity of the Jewish people, support a secure State of Israel, and mobilize on issues of concern to the local Berkshire community. It is important to us at Instant Car Donation that you receive the largest allowable tax deduction possible without having to navigate complexities or perform extensive research. We pre-qualify all of our participating 501-c(3) non-profit charities to verify your donation will be tax deductible. The process will be streamlined for both you and the charity of your choice. We will provide you with an IRS 8283 tax form after your donation is complete. Donating a car is one of the most financially responsible ways to make a large charitable contribution. Although the donee receives a tax benefit, the charity may benefit even more, by receiving a windfall that can help it to fund important projects. Because of this, one of our primary goals is to match donees with the charities that best reflect their beliefs and values. At Instant Car Donation, we always make charity choice an integral part of the process. For those of you who haven't decided on a particular charity, you can also indicate that on your contribution form and we will be happy to help your choose a charity that's right for you. There are many charities in your local area which can benefit from your car donation. We not only help you donate to a nearby charity, but we also focus on providing small local non-profits with an easy way to accept donations so that they can focus on their important work. Often the donation will make the biggest difference for such charities, bringing people together while helping support those in their local community who need it the most. Is there a tax benefit for donating my car? We can ensure your vehicle goes to a charity which is eligible to receive tax deductible contributions and help you recieve a reciept for your donation. If you itemize your deductions you may be able to get a tax benefit for your car donation. For donations up to $500 you can use Kelley Blue Book and for larger donations the charity must verify what they recieved for the car donation (more information). 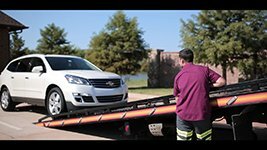 We will arrange a tow truck to come pick up your vehicle and we will take care of the entire process. It couldn't be easier to help the charity of your choice today! Do you accept donations for cars that are damaged or missing parts? Absolutely, we accept cars in all conditions! Go ahead and request to donate, and we will see what we can do for you. Can you help me find a charity that fits my personal values? We would love to help you make sure your donation goes to a cause you care personally about by helping you pick a charity that meets your personal values. In fact, this is so important to us that we do it every time you donate with us! Instant Car Donation proudly supports many respected local & national nonprofit organizations in your local area. We work hard for you to ensure the organizaion gets maximum support from your vehicle. How do I prepare my title? All owners on the title must complete the section of the title labeled "assignment of title by owner" or "transfer of ownership by seller". Most states require printing and signing owner names. You should fill out any fields that require information about a buyer/purchaser/transferee with information about who you are donating the vehicle to. You may find detailed instructions for your home state here. We will call you within 48 hours to make sure we have all your information and will arrange for a tow truck to come to you for easy pickup. If it is taking a bit longer feel free to contact us.